We found Gray Oak Studio on Instagram and have been loving their collaborative perspective on home decor. Recently, the trio of designers shared with us their story, style, and own inspirations. We hope you love this new, Massachusetts-based interior design company as much as we do! CoCo: What inspired you to become a designer? 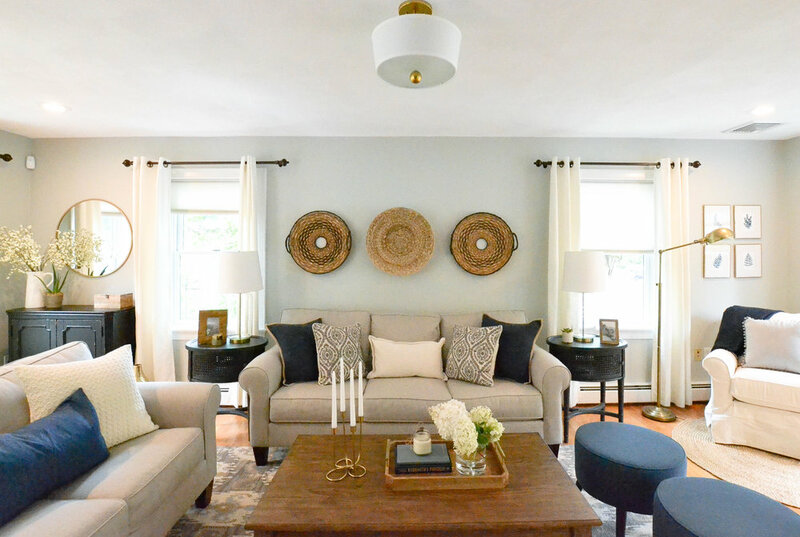 Gray Oak: We were all settling into our own homes – Sonia built her home, Michele and Leah renovated their homes – and found ourselves constantly discussing tile and molding and paint colors. We’ve been friends for years and at some point over the last year we realized how similar minded (and passionate!) we are about home design. At first it was a running joke that we should start an interior design business and then, very organically, the dream became reality. Five months later, here we are! CoCo: How would you describe the style of your work? Gray Oak: We don’t have one style. Between the three of us, we each favor a different style. Michele leans Farmhouse. Sonia leans Coastal. Leah leans Scandinavian. We take our different perspectives and work with clients to find the style that works for their lifestyle and feels like home. CoCo: How important is art in your work? Gray Oak: Art is really important and people can be really afraid of it. It can be difficult and a bit intimidating to choose something you love that’s not commercial…from IKEA or HomeGoods. We try to help clients think of an area of their life that we can translate into art. Art is so personal that the most important thing is for the homeowner to love it and not worry about whether others do. CoCo: How often do you recommend that a client commission a work of art, and why? Gray Oak: Often…if it’s in the clients means. And, we should take that back because commissioned art doesn’t always mean super expensive. What it really means is personal. Sometimes that’s hiring a well-established local artist, sometimes that’s finding a young art student whose ready for her first commissioned job or sometimes that’s finding a low key crafter at a local fair/festival. Can you tell we love local? CoCo: Describe one of your favorite clients. What made it fun and productive to work with them? Gray Oak: One of our favorite clients, and favorite projects, was a homeowner who inherently trusted us. Right from the start she was deferential to our opinion, even if it diverged from her instincts. She understood that considering design elements in a vacuum was unproductive and, instead, considering the big picture was tantamount. She had opinions, of course, but she bravely gave us the green light to run with our vision. Brushstrokes: Interview with CoCo Artist, Galen C.
Despite living in rural Vermont, CoCo Artist Galen C.’s paintings reflect the energy of the urban environment. As we interviewed Galen about her abstract paintings, she described just exactly what goes into creating unabashedly strong works worthy of making a statement in any setting. CoCo: How would you describe your artwork? Galen: I would describe my work as process-driven abstraction. My work moves forward through the investigation of materials and processes. It is physical, visceral, and visually compelling. CoCo: What inspired you to become an artist? Galen: I’m pretty sure I was just born that way. However, I did get the message from my mother at a very young age that being an artist was not only valid, but also important. CoCo: Who is your art for? What type of person are you speaking to? Galen: People who appreciate my work are those who embrace the imaginative qualities of abstract painting. They like the experience and pleasure of seeing something original and of bringing their own interpretation to the work. CoCo: What does your work of art bring to its environment? Galen: I only allow my best work to leave my studio. I do this, in part, because I want my paintings to have integrity and enduring appeal; I want them to stand the test of time and continue to unfold and reveal themselves to the viewer over the years. If I’ve done my job, my paintings will enrich and transform any environment in which they are placed. CoCo: What is the most important part of the artistic/creative process for you? Galen: The most important part of my artistic process is that I be present and open to what is happening in the moment. While I bring many years of painting experience with me into the studio, every painting is unique and has its own story to tell. It is crucial that I am quiet and vulnerable enough to be able to listen and allow that new painting to push forward. CoCo: What type of media do you use and why? Galen: I am currently working with three distinct media. I continue and will always work with basic oil on canvas or panel, as it is a rich and versatile material. I am also working on ink on paper constructions, which I began during a recent art residency in China. The third area of interest for me, which is also inspired by the work I began in China, is collaged paintings. These works involve cutting and ripping existing paintings and reassembling them into new works of art. It is a dynamic and endlessly interesting process. Take a girl to China, by Galen C.
CoCo: Tell us about an interesting piece that you have displayed in your own home? Where exactly is it, and why is it there? Galen: I have one spot in my living room that serves as a viewing spot for paintings that I have recently finished. Hanging new work and living with it for a while allows me to know whether or not it is really finished. Sometimes it takes looking at a painting for a while to know for sure. CoCo: What is your favorite thing about doing a commission? Galen: It is a great thing to create a work of art in collaboration with people who have are fans of my work and who have a vision and passion to work together. It is extremely rewarding to place a painting with people who love it and who were instrumental in its creation.